I loved hearing this woman's story with her own voice narrating it. 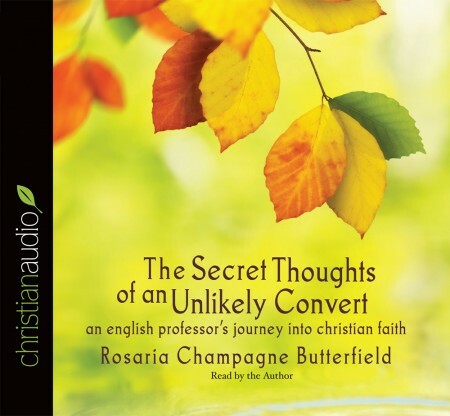 The woo of the Holy Spirit in small ways in Rosaria's life was encouraging to me as I listened. The Christian Community as a whole has much to learn from her perspective. Could the average Christian write a thoughtful letter as her future pastor did which would compel her to consider research on the Christian World View? Probably not. Learning to demonstrate Christ to not just the homosexual community, but the whole world, is something we must practice daily. This book will make you stop and think as you listen. There is quite a bit about the Reformed Presbyterian denomination woven into her story and rightly so since it is very key to how she practices her faith. I was not familiar with this denomination and enjoyed learning about it. Her story is also about their experience with foster care and adoption. Thank you, Rosaria, for your beautiful testimony.